A new display on the second floor of Bennett Martin library draws on the Heritage Room collection to show the chronological progression in the covers of Bess Streeter Aldrich's A Lantern in Her Hand, which has remained popular and in print since its first publication in 1928 (it went through 21 printings in that year alone). A Lantern in Her Hand is this year's One Book, One Nebraska Selection. 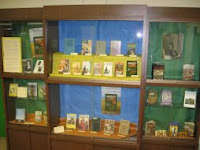 Other Aldrich books and foreign language covers are included in the display. Other notable influences on the book came from a live broadcast on local Nebraska radio station KFAB in February, 1926. Aldrich asked listeners for “true incidents of pioneer life,” hoping to use the material to flesh out the character study, drawn from her own family history, that would be A Lantern in Her Hand. She got far more than she bargained for. It took, she recalled, fourteen months to go through the correspondence, diaries, and scrapbooks that she received in reply. She worked many things from this material into the book, and did more interviewing and research besides. The book has been admired for its authenticity, beginning with a generation of readers who had intimate family knowledge of what the first European settlers experienced, and it has been much loved by readers who found their way to it. Our display looks at other aspects of Bess Streeter Aldrich's writing career, including her efforts to get Hollywood interested in her work. Here is a cover from her most successful attempt with the film Cheers for Miss Bishop, which premiered at the Stuart Theater in Lincoln in January, 1941. We also glance at Aldrich's international popularity, and the display includes a Hindi version, illustrated here, of her 1935 novel, Spring Came On Forever. Ongoing is the play Reviving Ophelia, based on the book by Mary Pipher (Lincoln). This continues through May 24th at the Loft at the Mill, see the Angels Theater Company web page for times and ticket prices. On Saturday May 2, at 7:30 PM, the Loft at the Mill will host Look Both Ways: Artists and Writers Collaborate. Seven (writer:artist) pairs will share their collaborations, including Karen Gettert Shoemaker and Judy Martindale; Pam Barger and Susan Brasch; Twyla Hansen and Carlos Frey; Marjorie Saiser and Meghan Stratman; Amy Plettner and Janna Harsch; Kathleen Cain and Marjorie Saiser; Kelly Madigan Erlandson and Jaime Hackbart. Also on Saturday May 2, Lee Booksellers events includes a book signing by former Lincolnite, and Science Fiction and children's author Brandon Sanderson, at 2:00 PM at Lee Booksellers in the Edgewood Center on south 56th Street. The John H. Ames Reading series at Bennett Martin Library will offer a May reading this year (the series usually closes in April) with Harley Jane Kozak at 2:00 PM on Sunday, May 17th. More about this in a later posting. On Monday, May 18th at at 6:00 PM writers will read from new plays they are working on at the Loft at the Mill, with writers to include Nebraskans Mary Douglass, Lou Leviticus, Michael Trutna, and new Hastings resident Robin Buckallew. Joe Starita was born in Lincoln and studied English and Journalism at the University of Nebraska. He went on to become an investigative reporter for the Miami Herald and the Herald's New York City Bureau Chief. He is also a former City Editor of the Lincoln Journal Star. He has been a Pulitzer Prize finalist for his reporting at the Miami Herald, and his earlier book, The Dull Knifes of Pine Ridge (1995) won him critical acclaim, local and regional awards, and another Pulitzer Prize nomination. His new book, I am a Man: Chief Standing Bear's Journey for Justice published just this year, is gathering the same kind of attention and critical interest as his earlier work. We look forward to hearing from him at 2 P.M. Sunday, April 19 in the Heritage Room on the third floor of Bennett Martin library.